We’ve been having a zone 6 winter this year. I could get into this especially if we get to keep our cool summers. Having mud time for 8 or 9 months of the year is not quite so attractive. We’ve had a pretty normal amount of snow, but it keeps melting. This is good because it has let me continue to bring in firewood. We’ve been going through a spectacular amount this year because we have the puppy door installed on the second floor. It’s wonderful for housetraining them, and Gaela still uses it. She goes out and piddles probably twice as often as the grownups need to. This way we get to sleep through the night. However, it isn’t really sealed on either side, so there is a massive draft, just where the cold west wind hits the house. The wood I’m pulling out is slash from the logging three years ago that was supposed to clear pasture for us. Getting the slash off the ground provides space for the grass to grow. 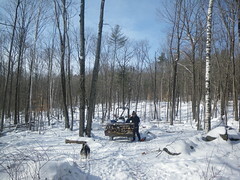 I’m also working on clearing a path to two stands of maple that I’d like to tap this year. A quick count estimated 50 taps between the two stands, and I can use tubing. I’d like to use barrels rather than 5 gallon buckets on the bigger taplines this year. Ten taps on a good day can fill a five gallon bucket in a couple of hours, and I can’t always get back more than once a day. Barrels will require a pump and close tractor access though. Fortunately I have a few more weeks to work this out. The sap is running now down in Connecticut, and chatter on the intertubes says it’s a real run. The way the forecast was last weekend I thought I’d be tapping on Groundhog Day myself, but every time I look, the long range forecast shows colder, though upper 20s (-2 to -4C) is not cold weather for February around here. But there will be no run, which will let me get old tubing fixed and new tubing up. Anyway, I’m now thinking to put in all my check valve taps on the 15th or so. Even if it is early, the check valves will supposedly keep a tap hole open for up to 12 weeks, which would be May. I’ll still have some buckets, and I’m not about to junk my taps without check valves, so those will wait, unless of course the run really starts. We’re buying most of our seeds this year from Lisa’s employee garden operation. She gets them in bulk and resells at cost. That also goes for onion plants. We had talked about trying to mass start them and selling them ourselves, but it turns out that Johnny’s is only like four cents a plant if you buy eight bunches, which won’t be enough for her. Still, we have a few items we want that aren’t suitable for beginners. We want to try again to start onions and leeks indoors, this time with a short day timer so they don’t bulb immediately. It’s also claimed that you can get a crop if you plant them directly in April. We’ll be trying both techniques with both onions and leeks. I’ll give shallots another try. I should have done so last fall, but I didn’t. Lisa will get bell pepper and jalapeno plants, but I’ll be trying New Mexico chiles (Big Jim cultivar) again. The pigs’ tomatillo crop didn’t do well last year, so I’ll try some of those. I know those can be planted outside. If it fails, well, we still have plenty of 2010 enchilada sauce to get us through. Celery and celeriac are both on the ‘keep trying till we get it right’ list. Lisa will have celery plants as a backup. We finally got a decent sweet potato crop last year. 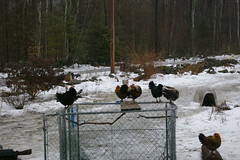 I’ll give them a better bed this year, and mother nature is more than welcome to kick in a better growing season. The same applies to tomatoes. We’ll be starting our heirlooms again. They really aren’t beginner friendly, but once you get them right, you’ll never go back. Last year was horrid for tomatoes, but again, we have plenty of 2010 stuff left. So much for my plans of cleaning up the basement, and I’m busy enough that my Catholic guilt hasn’t even managed to kick in. This entry was posted in Firewood, Gardening, Grow lights, maple syrup, Off-farm Jobs. Bookmark the permalink. Post a comment or leave a trackback: Trackback URL.